CONSERVATIONISTS OFTEN worry about the introduction of wild animals and plants to parts of the world where they did not evolve. These aliens can indeed do significant harm. But some settle down and fit comfortably into their new homes. Such is the case of the Egyptian mongoose, which is native to north Africa, but is also found in Spain and Portugal. It has, though, no pre-human fossil record in Iberia, and would be incapable of swimming across the Strait of Gibraltar. So the evidence points to it having been carried there by human agency. The question is, by whom? Like cats, mongooses were venerated in ancient Egypt for their habit of hunting troublesome rodentsâ"with the bonus that, unlike cats, they would also take on snakes. They are frequently depicted in art as avatars of Ra, the sun god, in his battles with the serpent deity Apep. This role as pest controllers resulted in mongooses being tamed (though, again like cats, never truly domesticated) as companions in the home. Until recently, the oldest known mongoose remains in Iberia dated from the Middle Ages, so the smart money was on the animals having been brought there sometime after 711AD, during the Islamic conquest of the peninsula, when the armies of the Umayyads crossed the strait from what is now Morocco. But this is now known to be wrong. A study just published in Science of Nature by Cleia Detry of the University of Lisbon describes two sets of mongoose remains which long predate the Umayyads. One was dug up in western Spain and the other in Portugal. 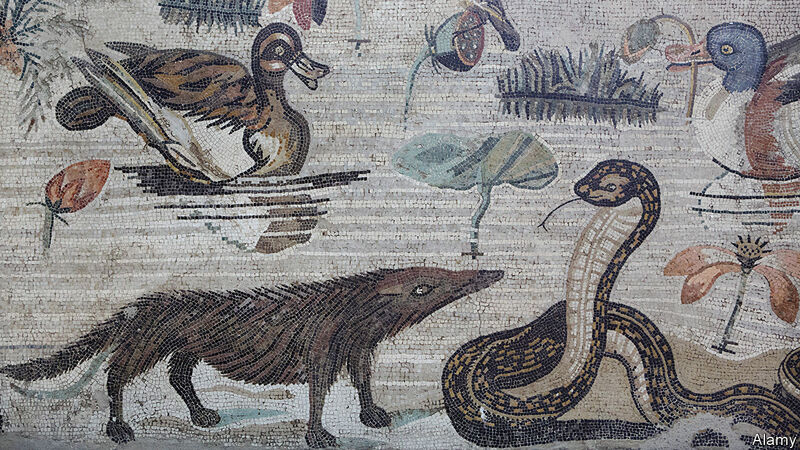 Carbon dating suggests both animals were alive during the first century AD, when Iberia was under Roman control (making them more or less contemporary with the mosaic below, buried in Pompeii in 79AD by an eruption of Vesuvius). That coincidence of age apart, though, the specimens could not be more different. The Spanish animal was an adult when it died, and was interred in a pit alongside 40 dogs and three human beings. The bones of the can ines suggest they were lapdogs. That a mongoose was included with these pets indicates it was also viewed as a pet of some sort. As for the pit, a funerary seal makes it clear that it was built for ceremonial burials. The Portuguese specimen, in contrast, is a juvenile that appears to have died in a burrow. This suggests it was a wild animal. Whether it had escaped, or was part of a population that had been living in the wild for years is unclear. It looks likely, therefore, that it was the Romans who brought the mongoose to Europe. But there is another possibility. Before Rome annexed them in 201BC, parts of Iberia were controlled by the Carthaginians, a north African people. This is, admittedly, more than two centuries before the animals Dr Detry has been studying were alive. But, given the scarcity of mongoose remains in Iberia, that is not such a great gap. It may thus have been the Carthaginiansâ"presumably familiar with tame mongoosesâ"who were responsible. Hanni bal Barca, the Carthaginian commander in the second Punic war against Rome, which resulted in Iberiaâs loss, is famous for bringing war elephants to Europe. Perhaps he brought mongooses as well, for pest control while making camp.